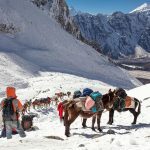 Manaslu Circuit Trek is one of the best trekking routes in Nepal, taking you to one of the most remote, untouched, and tranquil wilderness adventures of Nepal. 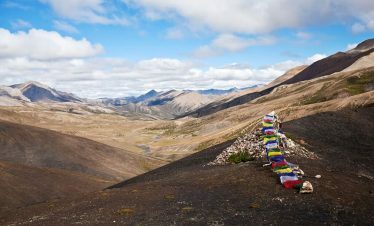 Opened to international tourists only in 1992, the trek to the natural border between Nepal and Tibetan plateau is a truly new and unique experience. The trek attracts adventure junkies from all over the world for a chance to witness or even summit the eighth highest mountain in the world. 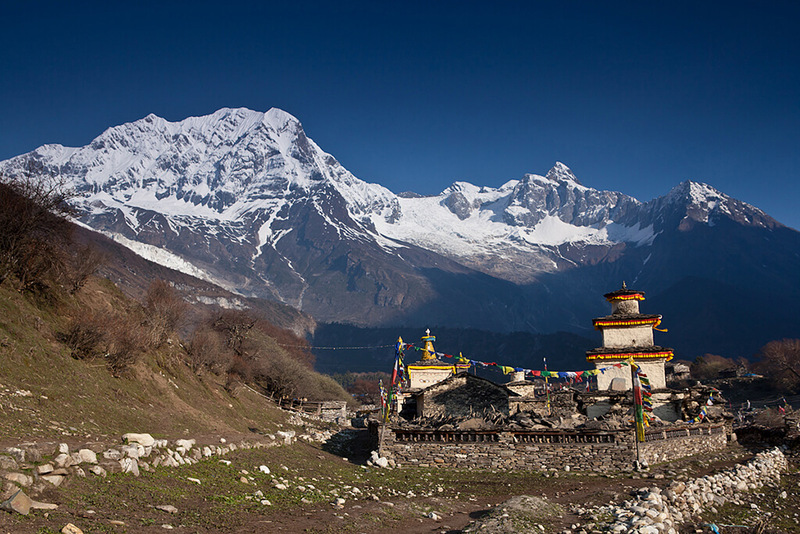 Manaslu peak looming at a height of 8,163 meters is a truly majestic sight that leaves all its audience speechless. 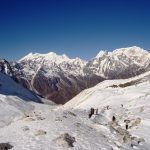 The destination of the trek is to the lap of the mountain, Manaslu base camp, at 4800 meters. 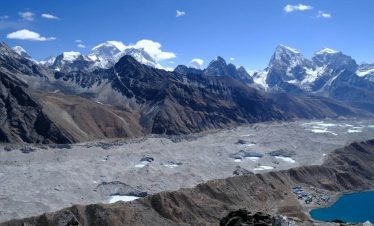 The trek starts from Arughat and ends at Besi Sahar, covering a varied terrain from lowlands to glaciers and moraines, passing through traditional villages with unique cultures. The trek requires a special entry permit to enjoy the biodiversity, majestic mountains, huge waterfalls and tranquil lakes in the beautiful trails adorned with bloomers during the spring season. The summit was first conquered in 1956 by the Japanese who had tried numerous times to ascend the mountain. 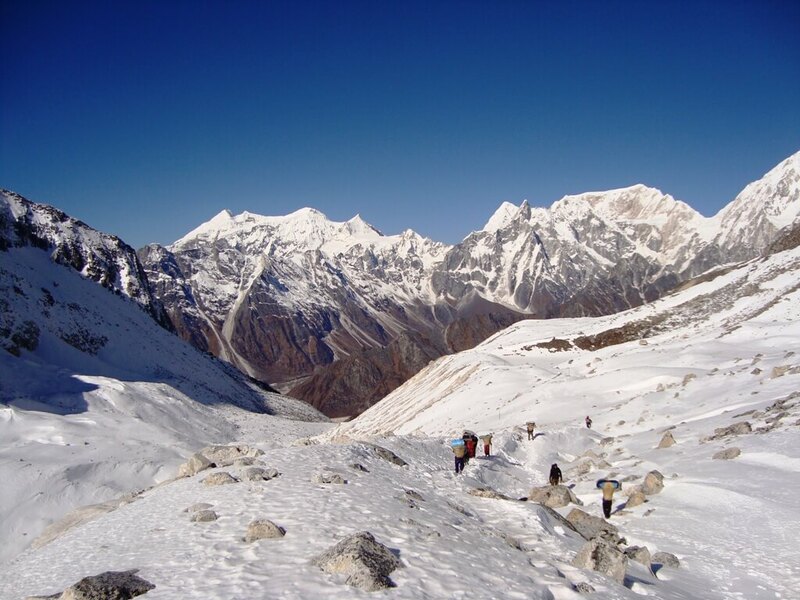 Manaslu is also called ‘Kutang’ and derives its meaning ‘mountain of the spirits’ from the Sanskrit word ‘Manasa’. 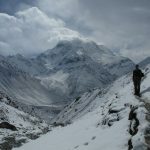 The circuit trek with its challenges, beautiful scenery, and tranquility is an adventure that truly enriches your soul. Day 03: Kathmandu to Arughat. Day 04: Trek to Soti Khola. Day 05: Trek to Machchha Khola. Day 06: Trek to Doban. Day 07: Trek to Phillim. Day 08: Trek to Deng. Day 09: Trek to Ghap. Day 10: Trek to Lho Gaun. Day 11: Trek to Sama Gaun / Sama Gompa. Day 12: Rest and explore Manaslu base camp. 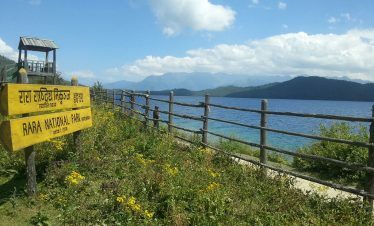 Day 13: Trek to Samdo. 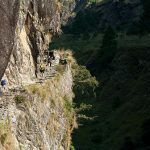 Day 14: Trek to Dharmashala. Day 15: Trek to Bhimtang. Day 16: Trek to Dharapani. Day 17: Trek to Jagat. Day 18: Trek to Besisahar. Day 19: Drive bus to Kathmandu. You will be welcomed by one of our representatives at Tribhuvan International Airport and transferred to the hotel. You will enjoy Nepali cuisine in an authentic Nepali restaurant. We spend the night at an elevation of 1200 meters in Kathmandu. We will take a tour of the beautiful, cultural city of Kathmandu. The sightseeing includes 7 UNESCO enlisted world heritage sites. We will visit Pashupatinath temple, Swoyambhunath stupa, Boudhanath stupa, Changu Narayan Temple, Kathmandu Durbar Square, Patan Durbar Square, and Bhaktapur Durbar Square. Once we explore the beautiful destinations, we can shop for gear and other items for the trek.Collect the permits and brief about trekking start next day. We spend the night in Kathmandu. From Kathmandu, we take a bus or a jeep to drive to Arughat. It takes about 4 hours to reach Dhading Besi. After this comfortable ride, we have to travel through a bumpy trail to finally reach Arughat after 4 hours. After 8 hours of driving, we reach our destination at 640 meters where we spend the night. We will follow Budhi Gandaki River and pass through different villages. The dirt road is perfect for a walk among the rice fields, waterfalls, and greenery. We reach Arkhet bazaar with its authentic bazaar vibe and Arkhet khola. We continue north as we enjoy the view of traditional, local houses. We spend the night in Soti khola at an elevation of 710 meters. From Soti Khola, we cross a bridge and trek through thick sal forests to reach a ridge above Budhi Gandaki River. After Khursane, the trail goes up and down, passing through waterfalls. It makes its way to rice fields after the steep, rocky paths along a cliff. Then we reach the Gurung village of Labubesi. Then, we reach the sandy river bed of the river, cross another suspension bridge and then finally reach Machchha Khola. We spend the night at an elevation of 930 meters. The trail goes up and down from Machchha Khola, crosses Thado Khola and finally reaches Khorlabesi. After a few other ups and downs, we reach the natural hot spring of Tatopani. Then, we climb over a ridge and cross Budhi Gandaki over a bridge. We climb a staircase and then another ridge to finally reach Doban. We spend the night at an elevation of 1050 meters. We start the trek from Doban by crossing a suspension bridge over Yaru khola. We climb stone stairs and then drop to the river and climb again to reach Thado Bhanjyang. From the west bank of the river, we climb over a ridge and along the river climb to a village called Jagat. Then the trail climbs a rocky ridge to Salleri and then descends to Sirdibas. The trail continues up to Ghatta khola and climbs to a suspension bridge that leads to Phillim. It is a small, beautiful Gurung village at an elevation of 1550 meters where we spend the night. The trek begins as we turn north from the village and travel on a leveled path that leads to Ekle Bhatti. 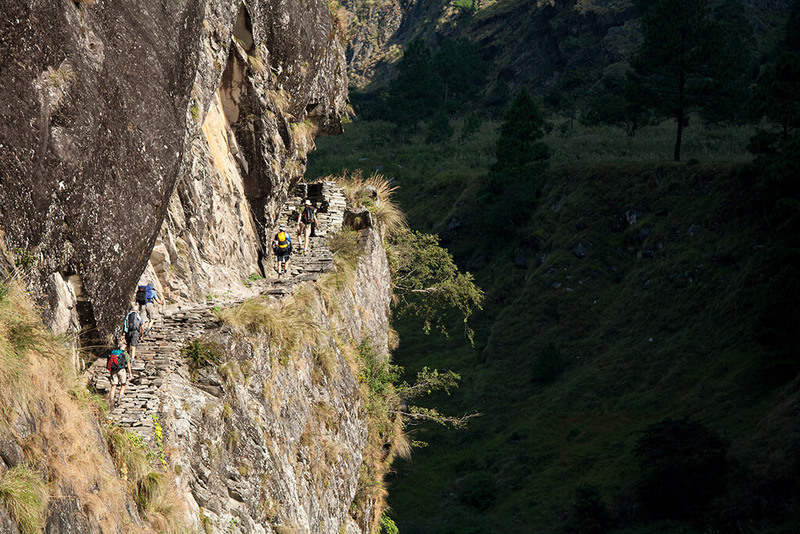 We enter a steep gorge and then descend down grassy slopes to reach the bank of Budhi Gandaki. We cross the river several times and the trail leads us to Deng khola after passing through wide valleys and bamboo forests. After crossing Deng khola, we reach the village of Deng at an elevation of 1800 meters. A short walk from Deng, we cross Budhi Gandaki river and keep climbing to meet a trail from Bhi. We take the west path up the Budhi Gandaki valley and pass through forests and Mani walls. After a while, we take a turn towards a corner that takes us to Ghap. We spend the night at an elevation of 2100 meters. 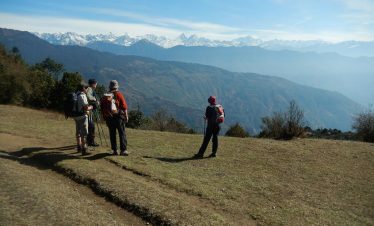 From Ghap, we take the trail through Prok village as we enjoy the mesmerizing views of Siringi Himal from there. We cross the river several times over suspension bridges and pass through Gompas in the trail. We keep walking past the forest and a narrow gorge till the trail ascends to reach Namrung. We witness Ganesh, Siring, and Himal Chuli from Namrung. We climb steadily to reach Lhi village and then the trail drops and continues on to reach the village of Lho. We spend the night here at an elevation of 3180 meters. 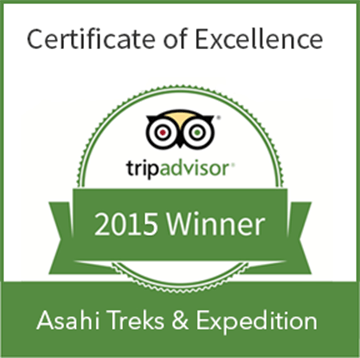 After enjoying the breathtaking views of Manaslu from Lho village, we start our trek towards Sama Gaun. 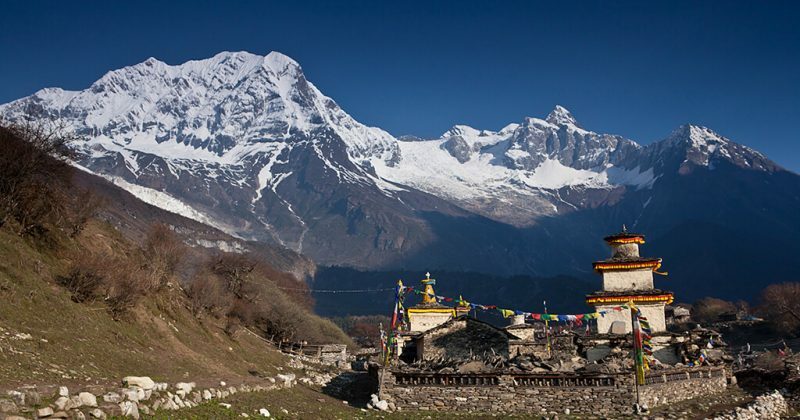 We explore the famous Ribung Gompa and relish the beautiful mountains like Himal Chuli, Ngadi Chuli, Manaslu, Ganesh and glaciers from Shyala village. As we continue on, we finally reach Sama Gaun. Samagaon is a beautiful village as houses with nice courtyards are aligned along the river. The village is bustling during the climbing seasons as people try to summit Manaslu peak. The climb to the base camp at 4000 meters takes about 4-5 hours. 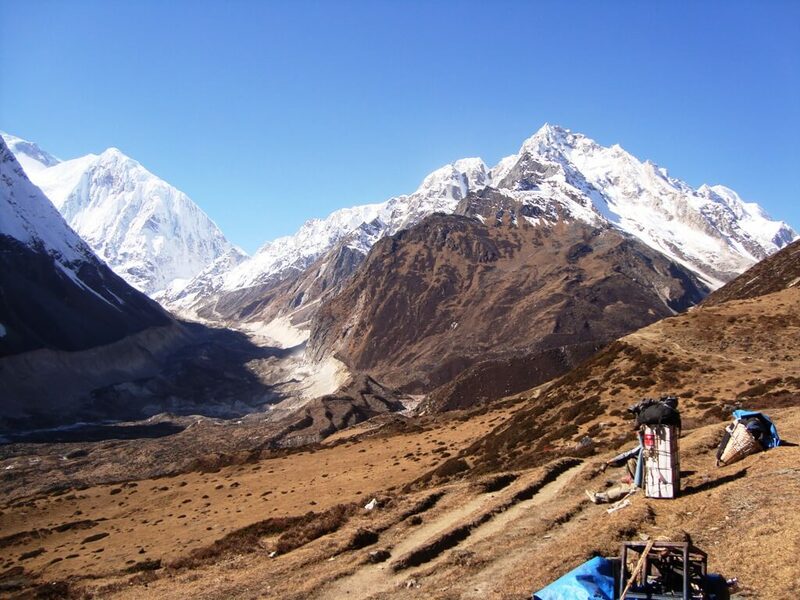 We first hike through forests and then on exposed slopes to the north of Manaslu glacier. As we go higher, we enjoy the sceneries of the glacier, a lake below and mountains that go on and on. The last part of the climb on a moraine is steep. As we relish the breathtaking mountain vistas, we meet with the climbers and hear their experiences. After the fun detour, we return back to Samagaon which takes about 3 hours. The trail descends to Budhi Gandaki again and follows the river to a stream. The trek meets the Larkya La trail and continues as the valley widens. We pass through Mani walls and forests of juniper and birch. We cross the river over a bridge and then continue to a confluence of two rivers. We reach a stone arch from where we can see kani, after crossing that we finally reach Samdo. We spend the night at an elevation of 3860 meters. Today, we cross Budhi Gandaki again over a wooden bridge and start an upward hike. We cross a few streams and also get a glimpse of Larkya glacier. We go around a valley and hike upwards again to reach Dharmashala. It is a guesthouse in Larke Phedi at an elevation of 4480 meters. After the short trek, we have enough time to rest and acclimatize. 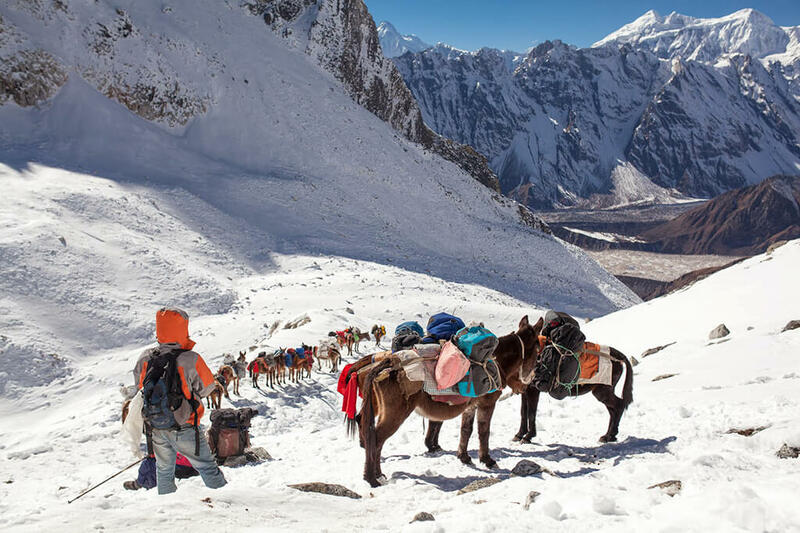 From Dharmashala, we make a short climb to reach a valley on the north side of Larkya glacier. 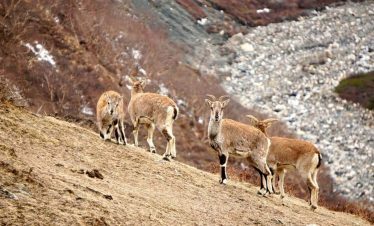 We can enjoy the magnificent views of Cho Danda and Larkya peak from here. We ascend the steep moraine of a glacier before we reach the Larkya pass. We witness the magnificent Himlung, Cheo, Kanggru and Annapurna from the pass. As we pass through low pastures, it is already evening by the time we reach Bhimtang. We end the day at an elevation of 3720 meters with the view of Mt. Manaslu looming nearby. Day 16: Trek to Dharapani via Gho. From Bhimtang, we descend and cross a high pasture called Sangure Bhanjyang. Then we cross Dudh Koshi River over a bridge. We pass through rhododendron forests and narrow valleys to reach a place called Karche. We pass through fields and then make a steep climb to a ridge. We return to the river bank as the trail makes an arc across the ridge. After a short distance, we reach the village of Gho. We spend our night here at 2560 meters. A short walk from Gho takes us to the beautiful village of Tilije. From here, we climb over a ridge and take the stone paved path that leads us through another village. We cross the Dudh Khola again, pass through a chorten-shaped arc and Mani walls to finally reach Thonje village. After going through a police checkpoint, we enter Dharapani which is also the entrance to Annapurna circuit. We spend the night here at an elevation of 1920 meters. We descend from Dharapani to Karte village and after a while cross Marsyangdi River over a bridge. After passing through some Mani walls on the trail, we reach the village of Tal. It is situated at the foot of a huge waterfall. As we go on following Marsyangdi river bank, we finally reach Jagat. We spend the night at an elevation of 1300 meters. 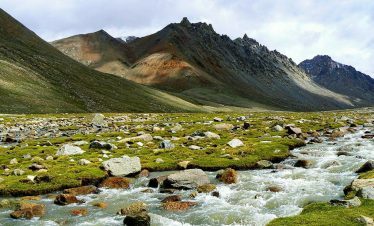 From Jagat, we continue our trek along Marsyangdi River to reach Syange. It is a beautiful village with mesmerizing surroundings. We then pass through waterfalls and cultivated lands on our trail to reach Bahun danda. From Bahun danda, we continue on the main trail towards Besi Sahar. 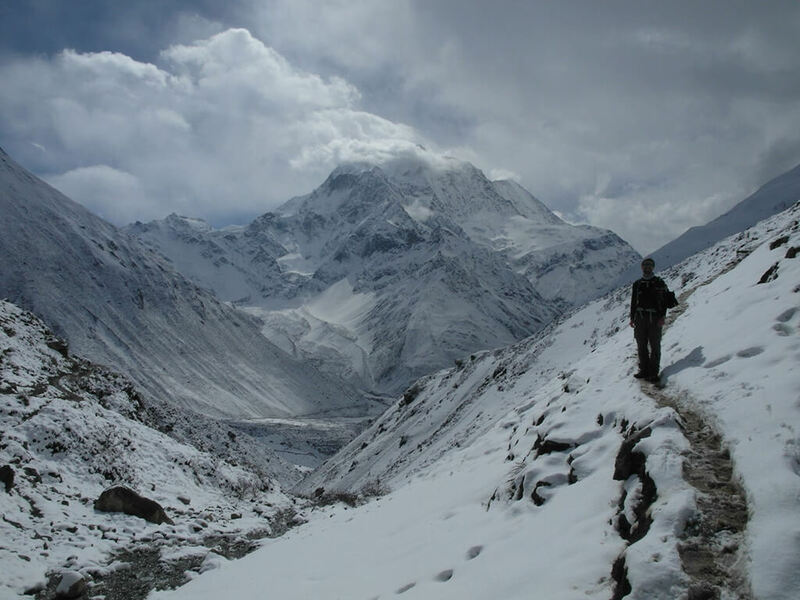 We are blessed with amazing views of Annapurna, Ngadi, Khudi, and other peaks on the route. We finally reach Besi Sahar at an elevation of 840 meters where we spend the night. From Besi Sahar, we drive back to Kathmandu along the scenic route with views of hills, terraced fields, and houses. It takes 6-7 hours to reach Kathmandu. We spend the night here as we enjoy the tourist hub, Thamel. We drop you off at the airport for your departure. We welcome you to explore other treasures of Nepal with us in your future visits. Entry Permit for Annapurna Conservation Area. Activities in Kathmandu and Pokhara such as sightseeing tour.